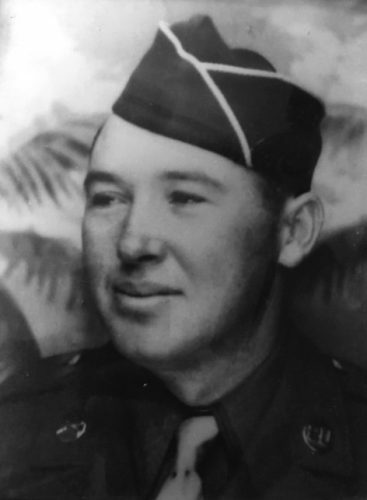 KINGSTON, Tenn. – Roughly 75 years ago, U.S. Army soldier Frank Delaney was killed in a foxhole during a fierce artillery battle in Germany during World War II. His remains were never identified and the 24-year-old from Tennessee was deemed unrecoverable. But now, thanks to a German citizen, investigative persistence and DNA testing, Delaney is no longer a missing man. Department of Defense officials said Monday that the remains of Army Pfc. William Frank Delaney, of Kingston, Tennessee, have been identified. Two military representatives visited the home of a relative of Delaney’s in Russellville, Kentucky, and informed him of the identification, said Frankie Copeland, Delaney’s niece. Officials said the 24-year-old Delaney was fighting with the 4th Infantry Division when his battalion launched an artillery strike against German soldiers near Grosshau in the Hurtgen Forest on Nov. 22, 1944. An artillery shell struck Delaney’s foxhole and he was killed. Delaney was among hundreds of soldiers missing after combat in the Hurtgen Forest. After the war, investigators with the American Graves Registration Command searched for remains in Grosshau. In 1947, a set of remains that had been discovered by local citizen Siegfried Glassen were sent in for identification in Neuville, Belgium. But attempts to identify the remains were unsuccessful. Designated “X-5425 Neuville,” the remains were buried in Neuville, at what today is Ardennes American Cemetery, according to a news release from the Defense POW-MIA Accounting Agency. Historians and scientists studied documents and military records and were able to find a likely association be- tween “X-5425 Neuville” and Delaney. The remains were disinterred in June 2017 and were analyzed using dental evidence and DNA testing. Delaney was officially accounted for in December. Copeland, who lives in Roane County, Tennessee, told The Associated Press she was named after her uncle, who went by Frank. A funeral has not been set, but Delaney is expected to be buried near Kingston, Copeland said. Copeland said Delaney’s family had been told he had jumped off a tank, onto a land mine. Delaney’s name is recorded on the Tablets of the Missing at the Netherlands American Cemetery in Margraten, Netherlands. Officials say a rosette will be placed next to his name to indicate he has been identified. “All of this new information is quite enlightening to us. We’re glad the Army pursued information about what actually happened,” said Copeland. Published on August 21, 2018 by John Romeiser. Corporal James Trenton Jones, from East Tennessee, served with the 117th Infantry during World War I. During his valiant service he was the recipient of the Distinguished Service Cross; the United States second highest medal for valor that can be given to a soldier in the Army. Tragically he died at age 32 in 1930. His family ordered a headstone from the Veterans Administration and for reasons unknown it was never delivered to his gravesite at Lynnhurst Cemetery. 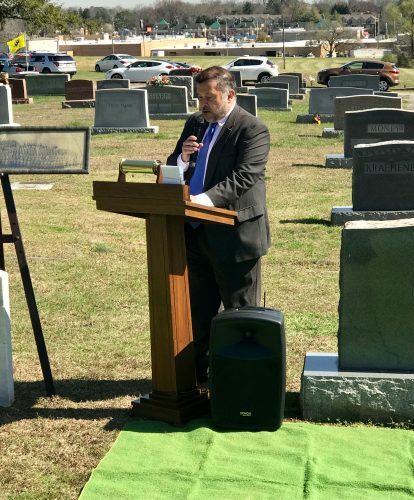 Major Gary Lowe and his brother Grady came into possession of the headstone over twenty years ago and carefully preserved the marker until it could be identified where Cpl. Jones was buried. James Trenton Jones was born August 28, 1898 to John Dowell Jones and Estelle Virginia LaPrade Jones. He was one of two sons born to J.D. and Estelle, and was the brother of Clyde Wallace Jones. 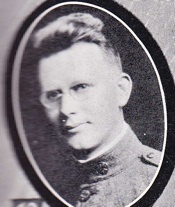 James volunteered for military duty on April 24, 1917–three weeks after President Woodrow Wilson asked for Congress’ declaration of war on Germany, he certainly possessed the “Volunteer Spirit” of his home state–and he would become a member of Company C, 117th Infantry Regiment, part of the 30th (“Old Hickory”) Division formed of Tennesseans , South Carolinians and North Carolinians. The troops of C Company were largely drawn from Knox County. In reviewing the makeup of C Company, commandred by Captrain George A. Blair, the unit included farm boys, mechanics, salesmen and clerks (like James Jones would later become) and students–a fairly broad section of the male population of Knoxville in the early 1900s. James and his buddies trained hard at Camp Sevier in South Carolina, beginning in the fall of 1917; by May 1918, these East Tennessee “doughboys” were en route to Europe on troopships. But, nothing could have prepared 19-year-old James Jones and his buddies for what they would face on the Western Front in midsummer 1918. The 30th Division was one of two US divisions selected to serve alongside British forces in the Flanders region of Belgium. With Britain’s forces hard-hit by a series of massive German offensives in spring 1918, the Old Hickory Division was sent to reinforce British troops around the ancient city of Ypres. Called “Wipers” by the hard-pressed British Tommies, this city was the scene of three separate battles and savage fighting in 1914, 1915 and 1917. In fact, Ypres was where in spring 1915, Germany intoduced poison gas against the Allies. The city and its surrounding villages were a sceneof utter devastation by summer 1918. (When one sees photos from World War I of soldiers, horses and mules half-buried in mud, those photos are often depictions of Ypres and its environs.) The moon-like and mud-churned landscape of the Ypres salient was where James Jones and C Company first experienced their first taste of frontline combat–and, it was almost his last. The 117th was assigned to a British forward training camp, where it was given its final training in trench warfare and in attacking strong points. After a few days of this work, the regiment was ordered into the battle line to face real-life trench warfare before all units were prepared for their first major offensive. During this time, C Company was caught in a massive German bombardment on its front-line positions, and in an outpost, detached from the main trench positons, was Corporal Jones and a group of light machine gunners, on July 24, 1918. Five of them became casualties–two died–and Jones himself was seriously injured by the shelling, but he kept his wits and, despite his own injuries, he did as any good non-commissioned officer would do: he took care of his men first, applying first aid to his wounded troops, until rescue came for them all. For his actions, he was decorated with the Army‘s second highest medal, presented for extreme gallantry and risk of life in combat, the Distinguished Service Cross. The President of the United States of America, authorized by Act of Congress, July 9, 1918, takes pride in presenting the Distinguished Service Cross to Corporal James T. Jones (ASN: 1307409), United States Army, for extraordinary heroism in action while serving with Company C, 117th Infantry Regiment, 30th Division, A.E.F., near Ypres, Belgium, 24 July 1918. Corporal Jones was in charge of a detached automatic rifle post, heavily bombarded by the enemy. Two of his men were killed by shell fire, two others and he himself seriously wounded. Though it was his first experience under fire, Corporal Jones exhibited unhesitating devotion to duty by remaining at his post. Sending for assistance, he reorganized his position, and gave aid and comfort to the wounded. While his wounds were described in his DSC citation as serious, he nevertheless recovered enough to return to C Company and the 117th. After two months of action near Ypres, the 30th Division was transferred south to northern France, where Jones caught up again with his unit. He fought alongside them next at the 30th Division’s most famous battle: the cracking of the Germans’ vaunted Hindenburg Line near the northern French town of Bellicourt in fall 1918. On September 29, 1918, alongside British and Australian troops, the 117th and the rest of the 30th Division stormed this supposedly impregnable defensive line of the Germans at one of its most highly defended points: the three-mile long tunnel of the Saint-Quentin Canal. 45 feet wide and in places 30 feet deep, the canal was studded with machine-gun nests, barbed wire, interlocking trenches and secret passages into the safety of the bombproof canal tunnel. The tunnel’s entrances were even more heavily fortified. Just over a month later, Imperial Germany would sue for peace, and Armistice Day followed on November 11, 1918. In addition to the Distinguished Service Cross, Jones was also decorated with the Belgian Croix de Guerre ( in Flemish, Oorlogskruis), with palm, Belgium’s highest award for bravery and military virtue on the battlefield, as well as the Victory Medal awarded to all the AEF’s doughboys . James T. Jones died December 11, 1930; at the time of his death, he was only 32, still, a young age even 85 years ago. His apparent cause of death was a heart attack. One has to wonder, though, how much of his postwar life and health had been shaped by the wounds, sights, sounds, and experiences he had faced twelve years earlier in the muddy and gas-clouded trenches of the Western Front. As we know, not all injuries of war are physical, and we can only speculate how much of these experiences of war followed Jones in his relatively short post-war life. He left behind a widow, Lucia Gilmore Jones, and two children. So, today, over 86 years after his death, let us recall James Trenton Jones, and remember the service and sacrifice of him and a host of young men from across Knox County and East Tennessee, who comprised, in the words of Ernest Hemingway, the “Lost Generation”: the veterans and survivors of the First World War. Published on March 11, 2017 by John Romeiser. First Lieutenant Saunders, United States Marine Corps, made the ultimate sacrifice on June 17, 1970 when his plane crashed in inclement weather during a routine mission near Yakota Air Base, Japan. 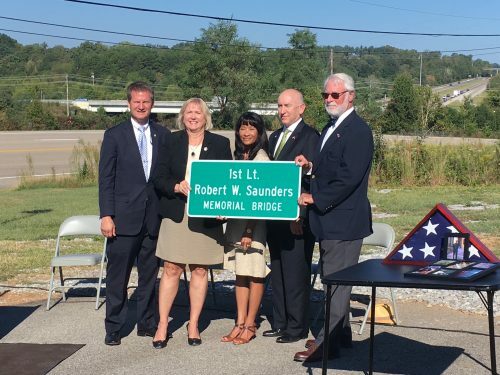 The bridge dedicated in his honor is the one spanning State Route 162 on Dutchtown Road in Knoxville. Knoxville Senators Becky Duncan Massed and Richard Briggs dedicated the bridge September 21, 2016. Published on September 21, 2016 by John Romeiser. 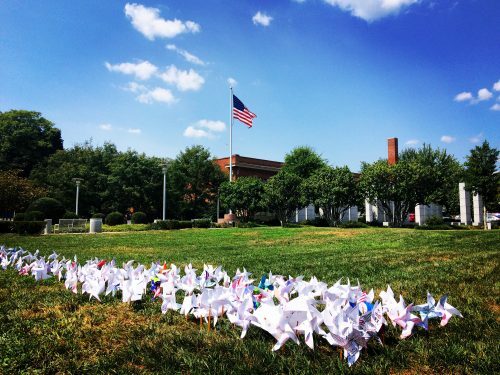 The L&N STEM School 9/11 held a Remembrance event and ceremony at the Memorial and then placed patriotic “pinwheels” they had created during class on the Lawn just south of the Memorial. Published on September 12, 2016 by John Romeiser. 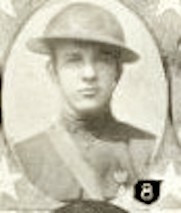 Richard F. Kirkpatrick volunteered his services to the U.S. Army May 29, 1917. First assigned to Company F, 138th Infantry, 35th Division, and later transferred to Company L, 306th Infantry, 77th Division. Embarked for France in May 1918. Saw service on the Swiss border and in the Vosges Mountains. Attended an Officers Training School for three months and received a commission as second lieutenant. Killed in action October 1, 1918, in the battle of the Argonne. His remains were returned under Special Order #64 of 1 September 1921. They departed Hoboken, New Jersey by train to Washington D.C. and then to Knoxville, Tennessee. He was buried at Old Gray Cemetery in Knoxville, Tennessee. Published on October 18, 2014 by John Romeiser. Published on September 13, 2014 by John Romeiser. Published on September 11, 2014 by John Romeiser.